Question presentation types: text field, text box, radio buttons, drop down lists, checkboxes, and scrolling lists. Flexible presentation options for each question presentation type. Survey questions, layout and responses are stored in a relational database. Survey creation can be accomplished through an interview process or by importing an HTML document. Surveys can be configured to require identification or allow anonymous responses. Survey response pivot table reports can be generated in HTML and MS Excel formats. 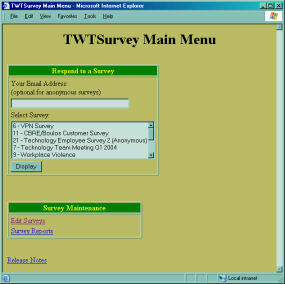 TWTSurvey is licensed by the server. Purchase of a license	of the survey program includes a non-transferable license of the full source code for the system. Send an email to sales@TransWebTools.com to receive a quote.